As in any real estate, Investing in UK real estate has its peculiarities. For non-UK investors this can be even more complicated. We have listed the most frequently asked questions (UK real estate FAQ). Why are rental yields so much higher in UK? The Real estate market in UK has developed differently from other countries and markets. As rental income is taxed at the highest income rates, the expectation of returns is higher. That does not really apply to London, where most owners are foreign investors, speculating on ever-growing prices rather then annual yields. In London, you can expect yields of 1-2%, outside of London you should expect a yield of 6%-8% for residential and 8-10% for commercial real estate. Not only the legislator and the tax man make a distinction. Also the investors. Residential real estate is dependant on the fashion of the moment for the area, so can appreciate (and loose value) a lot faster. Location here is key. Commercial real estate is a lot more stable, as it value depends directly on the profit it generates, not whether the location is fashionable. So expect less variation in the price. For small-size investments (eg student flats, care homes, storage boxes, hotel rooms etc) there is often a pre-agreed rental fee and even exit included in the deal. Partner choice is key. Do I pay tax on my rental income? Yes, you do create a taxable income. Foreign investors can often choose to have this taxed at the source (20%) or to start paying taxes on their UK income. For the first 11.000£ income, the income tax however, is 0%. A bookkeeper will need to do some paperwork for you (expect £300 cost /year) to file your income, but as long as you have less then 11.000£/person UK-sourced income, you will not pay tax. Some home countries will expect you to declare the income also at home. Many countries (among them most EU countries) have double income tax treaties to avoid paying tax again in the home country. How much stamp duty and VAT do I pay on my purchase? Calculating Stamp duty is not very straightforward. It depends on the type of investment and the total amount. Up until 125.000£ (residential) or 150.000£ (non-residential) there is no stamp duties. The government provides a tax calculator to find out. Of course we will provide you stamp duty costs for all the projects we offer. VAT can be a tricky issue and again depends on he situation from one property to another. We will provide you all information on property-by-property basis. How can I sell my property again? Each of the projects we are offering is freely sell-able on the open market. Some of the (commercial) projects have a sell-back option to the developer. You can at any time go to any real estate agent – preferably in the region – to sell the project for you at market prices. Of course we can also resell your property for you. Do I need to travel to UK? For none of the proposed properties, your presence in the UK is necessary. All paperwork can be done in your home country. But of course you are always more then welcome to come check it out. Of course, we have visited all of the projects ourselves (and invested in many of them). We organise monthly tours if you wish to come check it out. Is there purchase and sales costs? In most cases the purchase costs (mostly legal costs) are included in the announced price. If not, they would mount o +/- 1.000-1.500£. You are of course free to appoint (and pay for) your own lawyer (we can bring you into contact with some good lawyers). If you sell your property again through a local agent, you should count on 3% sales costs and a few 100£ for ownership transfer costs. Do I need to find a UK notary? The UK knows the “land registry”, but normally the lawyers take care of the communication. All properties on our list have a dedicated lawyer (often paid for by the developer) that knows the project very well. But feel free to find your own lawyer. We can also recommend one to you if you wish. Freehold is ownership for eternity. Leasehold is ownership for a limited period, usually 125, 250 or 999 years, after which the freehold owner can take possession again. In most commercial transactions, you will be buying leaseholds. In most residential transactions you will acquire a freehold. Can I get local bank financing? Most banks in UK will not provide mortgage loans to non-UK citizens. We have found 2 banks prepared to do so, but have found that their criteria are quite strict: you need to prove regular income, keep minimum amounts on a UK account, apply to minimum amounts, etc. Expect 60% LTV and around 3-4% interest rates. Talk to us for more information. You would also have the option to lend money at your home bank. In most cases, these banks will not accept UK property as collateral, so you may need to provide other collateral. Re-opening credit on your existing home mortgage, normally works quite well. That is where it all started. When looking for better investment return in 2012, I have been searching to find better places for real estate investment, focusing on yield, rather then (potential) appreciation. I have checked and travelled through Europe and found UK real estate to be among the best in terms of annual yield and stability. Since 2012, I have made a good number of transactions in UK. As I had gathered the experience of investing in UK as a foreign investor, I thought it might be interesting also for other investors: hence UK-realestate.com. For other questions, best to contact us and we help you as best as we can. 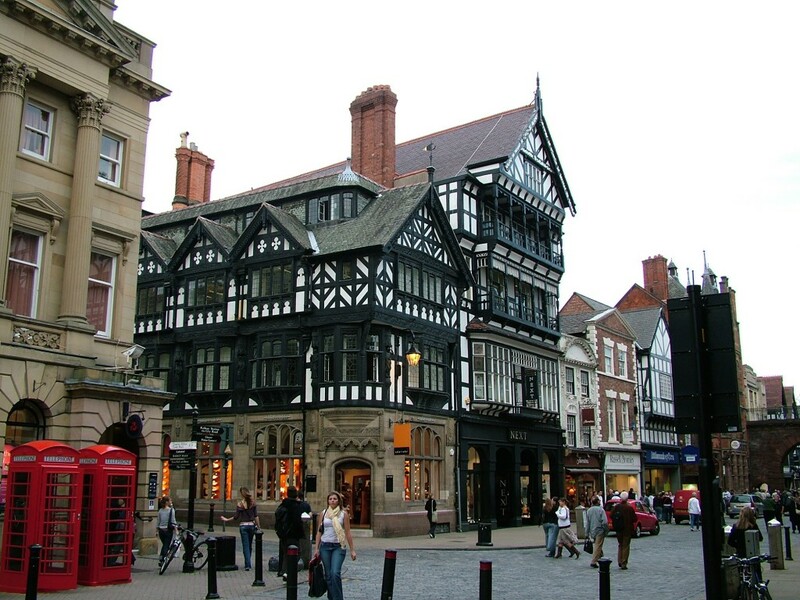 In 2nd tier cities like Chester, you can live pleasantly for a reasonable price.